An early production-model Studebaker Avanti was ready, despite a UAW strike, by April 1962, for the New York International Auto Show. When it was unveiled on April 26 the show had already opened, but Studebaker had kept the car under wraps for days until a shareholder’s meeting in South Bend, where a second prototype was simultaneously unveiled. Both unveilings were a sensation. In 2007 the Canadian International Auto Show in Toronto included an Avanti in a re-creation of the original display at the 1962 show. In 1983-84 Stephen Blake dazzled crowds by assembling half a dozen Avantis at the Washington Auto Show where admirers chattered about the car that was "years ahead of its time." 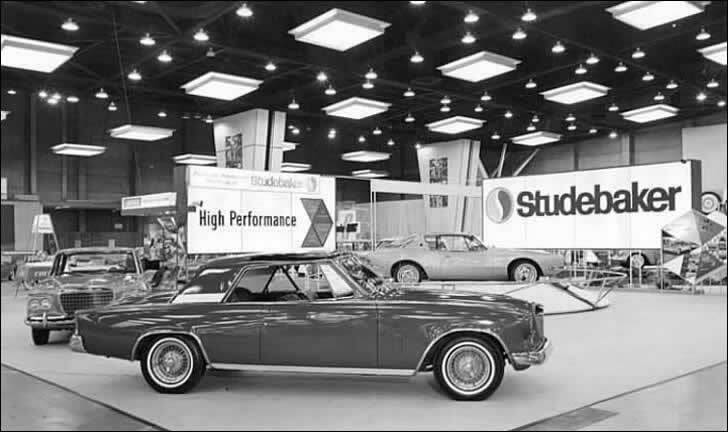 "High Performance" Studebakers including the Avanti shown at the 1963 Chicago Auto Show.